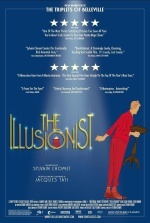 Sylvain Chomet's superb new animated feature, The Illusionist, functions as an affectionate homage to the films, spirit, and persona of French filmmaker Jacques Tati, all within a poignant fairy tale about grace and compassion. Oh, and it's also flat-out gorgeous--a triumph of design that boasts fresh delights at every turn. Chomet discards the surrealism of The Triplets of Belleville for this more grounded tale of entrances, meetings, and exits in the fading vaudeville community of 1950s Europe. However, the former film's hallmarks remain: grotesque characters, a reliance on pantomime and mumbled dialog, and a setting realized with breathtaking artistry. Based on an unproduced Tati script, Chomet's film follows the titular stage magician (a caricature of Tati and his Monsieur Hulot character) through a sequence of humiliating gigs, picking up a guileless country girl along the way. The pair eventually settles for a time in a splendidly rendered Edinburgh, where their tender relationship deepens and evolves. Chomet presents this mellow, tearful story with an appealing blend of uneasy pathos, endearing zaniness, and black humor. The Illusionist is a giddy reminder of the evocative potential of traditional animation, a potential that attains full flower in the hands of a master such as Chomet.